Zion Market Research has published a new report titled “Energy Efficient Lighting Market by Source (High-Intensity Discharge Lamps (HID), Linear Fluorescent Lamps (LFL), and Light Emitting Diodes (LED)): Global Industry Perspective, Comprehensive Analysis, and Forecast, 2017 - 2024”. 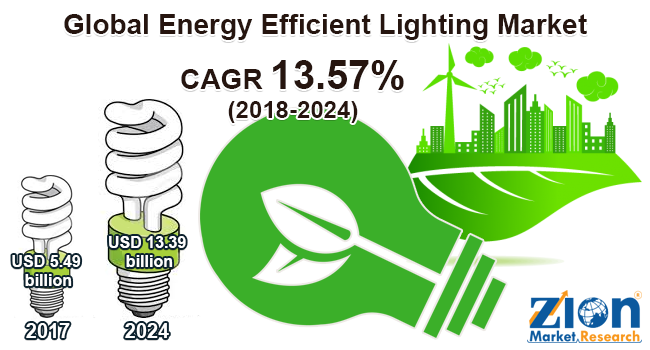 According to the report, global energy efficient lighting market was valued at approximately USD 5.49 billion in 2017 and is expected to generate revenue of around USD 13.39 billion by the end of 2024, growing at a CAGR of around 13.57% between 2018 and 2024. Technological advancements in the lighting systems not only provide energy efficiency but also offer additional benefits such as light ambiance, ventilation, and warmth. In addition, these lighting devices add the aesthetic beauty to the house and eliminate the need for artificial heating and cooling. A large amount of energy heat is emitted by buildings because of improper insulation or due to radiation. Thus, installation of smart lighting devices helps in efficient energy consumption and effective regulation of thermal room temperatures. The efficient lighting devices also minimize the requirement for power-driven temperature control systems. Such factors are expected to drive the energy efficient lighting market growth over the forecast period. The government initiatives for energy saving in order to maintain sustainability and the eco-friendly environment are also factors that are fueling the growth of the market. The energy cost differs among developing and developed countries, governments of respective countries are formulating rules and regulations in order to ensure adequate power generation. In comparison to traditional lighting devices, the energy-efficient lighting devices such as LED and CFL aid the organizations in the conservation of energy and cost-effectiveness. Such factors are contributing to the growth of the market. The energy efficient lighting market is categorized on the basis of the source into light emitting diodes (LED), high-intensity discharge lamps (HID), and linear fluorescent lamps (LFL). LED segment held major revenue share in 2017. The growth is attributed to the cost-effectiveness of LFL’s; this segment holds more than 40% share of the market followed by the LED and HID segments. LED and HID lightings have a significant share in the energy efficient lighting market but their mutual share is forecast to drop in the future with LED being the major of energy efficient lighting devices. North America, Europe, Asia Pacific, Latin America, and the Middle East & Africa are regional segments of the global energy efficient lighting market. The Asia Pacific held significant revenue share in 2017 and is expected to continue its regional supremacy over the forecast period. The growth is attributed due to the rising demand for energy efficient lighting system in order to save energy. Also, the countries such as India, Japan, and China are spending and investing capital in new technologies of lighting systems. As the Asia Pacific is a manufacturing hub, rapid industrialization is also the factor which is contributing to the growth and development of the market. Europe and North America have developed nations, which forecast to have a stable growth in the energy efficient lighting market. Government rules and regulations regarding the eco-friendly environment are boosting the market growth in these regions. Some of the industry players operating in the energy efficient lighting market include Eaton, OSRAM GmbH, Dialight, Digital Lumens, Inc., General Electric Company, Toshiba Lighting & Technology Corporation, Bajaj Electricals Ltd., LIGMAN Lighting Co., Ltd., Zumtobel Group AG, Cree, Inc., and Philips Lighting Holding B.V.